Koos, a licensed clinical social worker, visited OCCC to present students with information about alcohol use and misuse. Some 1,825 college students between the ages 18 and 24 die from alcohol-related injuries each year, she said. Statistically, alcohol misuse is more commonly found on non-commuter campuses. One 12-ounce beer, one 5-ounce glass of wine or one 1.5-ounce shot of hard liquor is each considered one drink. Men can usually have more drinks than women without being affected. It takes men around four drinks and women around three drinks to be impaired by alcohol. Nothing can speed up the rate of metabolism to reduce the alcohol level in the blood stream and allow for someone to return to their normal state of mind. Only time can help a person sober up, Koos said. In a recent study, 45 percent of college students were reported as binge drinkers. 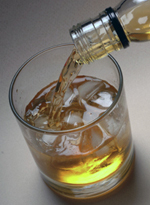 Binge drinking occurs when many drinks are consumed in one sitting at a fast rate. For men, binge drinking is defined as around five or more drinks within a two hour period and four or more drinks for women. When experienced on a regular basis, binge drinking can lead to addiction and possibly even death, Koos said. Alcohol is a mood altering depressant drug. When someone drinks to cope with depression or anxiety, it will make things worse in the long run, Koos said. When used on a regular basis, alcohol causes depression. A large number of unintentional injuries, assaults, and sexual abuse in adolescence through adulthood are related to alcohol and drugs, Koos said. This is one of the many Brown Bag lectures presented by the Student Life of OCCC. To learn more about attending Brown Bag events, visit the Student Life website at occc.edu/studentlife.